Because of their tiny business strike mintages, the 1851 and 1852 command a great deal of attention when they appear at auction. But the proofs for those dates are actually more available than for most pre-1858 dates. The 1853 is a reversed situation. It has a business strike mintage of 46,110 pieces, which is low but much larger than the combined 1851 and 1852 emissions. Business strikes are relatively plentiful, at least in grades through XF. Proofs are a completely different matter. 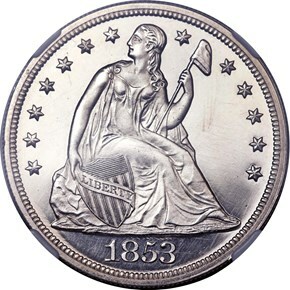 Duncan Lee, in his August 2006 supplement to the Coin Dealer Newsletter, lists the 1853 as tied for third place for proof rarity within the entire Seated dollar series. 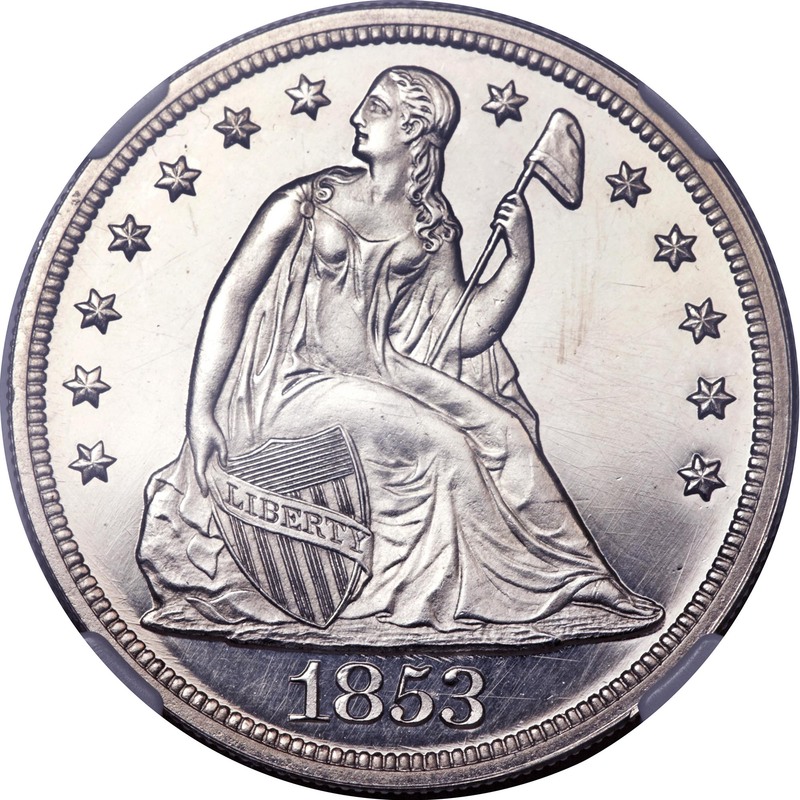 With one exception, all proof 1853 Seated dollars are believed to be restrikes. None are known to have appeared at auction prior to May, 1864, when one was listed in W. Elliot Woodward's John F. McCoy Collection sale. The diagnostics for the proof 1853 are well known. There is a series of diagonal die lines beneath Liberty's rock, over the 853 in the date. The flag of the 1 in the date is repunched south. The upright of the 1 is centered over a denticle. 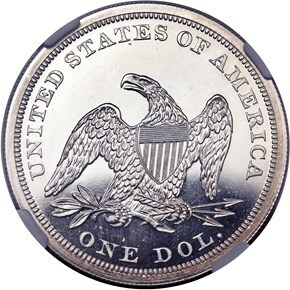 The reverse features a diagonal die line on the rim over the N in UNITED. 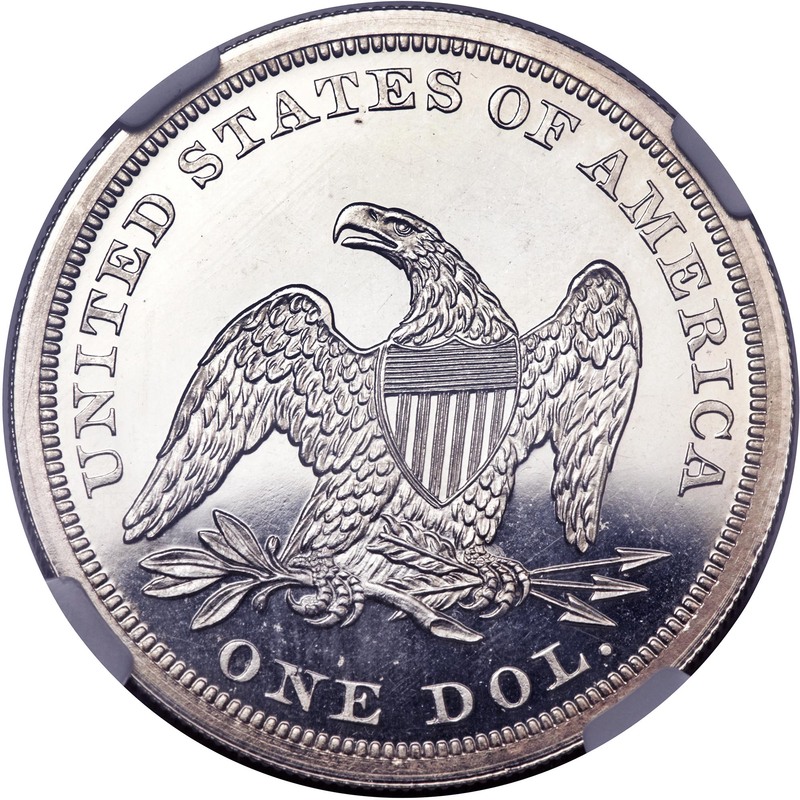 The dies used to coin business strikes are readily identified by heavy die polish lines within the eagle's shield. The date is differently placed, with the upright of the 1 centered between denticles. Clash marks are usually present on the field near Liberty's raised elbow.